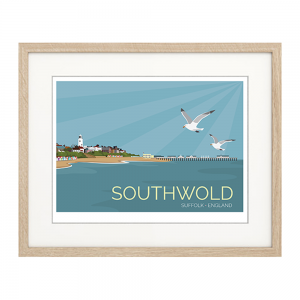 Southwold – a firm favourite for family holidays, beachcombers and dog walkers. With its Grade II listed lighthouse, world famous Adnams Brewery and it’s traditional pier, Southwold is the perfect way to sample the delights of the British seaside. Just brace yourself for the North Sea wind. Prints available to buy unframed on Etsy as A4 (£12) or A3 (£20).